My grandmother Julia Bernice Burkiewicz was born in 1891 came to the USA in 1906. Her sister Waleria Burkiewicz was born 1894 married a Michota in Poland and gave birth to daughter Janina Michota in Poland 16 Aug 1918 Waleria's husband died and she left for the United States with Janina later on. There is suggestion that Julia and Waleria had a male sibiling (name I would like to know) and that their parents died (names I would like to know) therefore the children were raised by an aunt and uncle, names I would like to know. A family member suggested Kraśnik, Poland and I have also heard Lublin referred to several times. My grandmother always indicated she was from the country side and close to a lake where she learned to swim. Apparently her parents house was bombed and only a basement remained. I would like to know how her parents died and if there are any documents I can obtain as well as remaining relatives in the area where they came from. This is from the ship's passage, I have no clue where this town is located and if the name has changed. There are several places with the name Dzierzkowice within the same area (Cf. attached map). Based on the info you posted a likely location would be Dzierzkowice Podwody. All the places in the area list the parish to which they belonged as Dzierzkowice Majorackie. That would seem to be a good starting point for your research. Hi, and thanks for your immediate reply Dave. I need to get further clarification … when you refer to the "parish" to which they belonged, is Dzierzkowice Majorackie another geographical community name or Catholic Church Parish. There are several areas here in the United States where they refer to regions as Parishes and Buroughs so without familiarity I feel a little lost, sorry. I do not read Polish and I would think that my grandmother and great grand parents records would have been recorded in their local church. Do you have any clues as to how to point me to locate those records or who I might be able to contact? If you post your letter in the form either I or someone else will be able to suggest any additions or corrections. Attached is a screenshot of the parish info. If you have any more questions, please don’t hesitate to ask. Interestingly, there do not appear to be any civil copies of the BDM records, either. 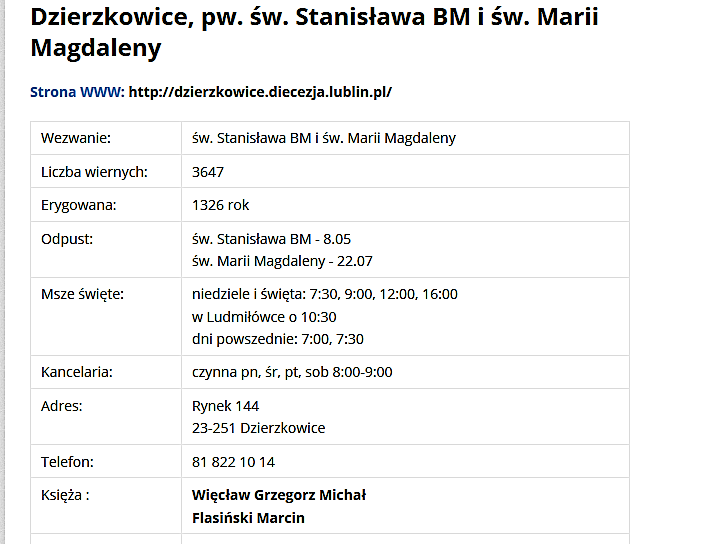 The regional archives in nearby Lublin, have nothing in their holdings catalogue for Dzierzkowice.